Godaddy $1 Hosting: Today we’re excited to feature an amazing Godaddy $1 Hosting Coupon promo on our blog. Under this promo, you can buy Godaddy’s Windows (ASP.NET Hosting), Linux or Wordpress hosting plan in just $1 per month along with a free domain name of your choice. You also receive 1 Business mailbox with 5 GB of storage space for 1 year for free. The Godaddy 1 dollar hosting offer is currently up and running only on Economy Hosting Plan. Lots of our visitors have already get benefited from this offer. We don’t know how long this offer will be available so we advise you to avail this offer today. Note: $1 per month Discounted price is only applicable to Economy Hosting Plan & will automatically added to the cart as soon you will click on this link. After clicking on the link proceed to the cart to see the final discounted price. When you scroll down the page a bit you’ll find 3 hosting plans i.e Economy, Deluxe, Ultimate. Out of the 3 plans, You’ve to choose the Economy plan to avail Godaddy $1 hosting promo. Don’t bother the price mentioned on this page as the final discount will be added to the cart. 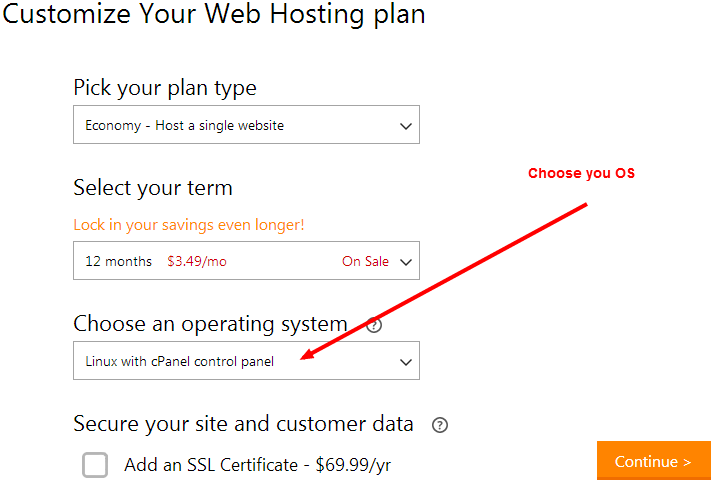 When you’ll click on Add to Cart button it will take you to the next screen which says “Customize Your Web Hosting plan“. On this screen, you choose your preferred operating system i.e Linux or Windows and leave other fields intact. Choose Windows if you’re looking for ASP.NET or MVC hosting, Choose Linux if you want to host a PHP, WordPress,Joomla,Drupal or any open source website or application. Now in the above screen, you can see that the discount has been applied to your order. You only required to pay $12.18 and your total saving is showing as $86.87. Note: You can pay in your local currency. Godaddy supports most currency after you activate Godaddy $1/monthly Hosting offer using the link mentioned above, you will see the pricing in your local currency. Update 1: Godaddy $1 Hosting offer has been extended. The offer is currently live. Follow the steps as mentioned above to avail this offer. Godaddy’s deluxe & ultimate hosting plans are also in 50% discount. If you would like to host more than 1 domain name, you may buy deluxe & ultimate hosting plans. Update 2: The $1 web hosting plan from Godaddy only allow you to host a single domain, so if you want to host more than 1 domain, you can buy Deluxe or Ultimate web hosting plan from Godaddy. Under this offer, both plans are at 50% discount. Click the link below to activate the deal. The 1 dollar web hosting offer from Godaddy is applicable for both new & existing customers. Important: To get this limited period offer, you can create a new account with Godaddy, or can log in to your existing Godaddy account. 1 Business mailbox with 5 GB storage space for 1 year. Question: Is Godaddy $1 Hosting Good For WordPress (Review)? Answer: Yes, It is absolutely OK for running WordPress websites. We ourselves are using Godaddy hosting to run this website. Godaddy Economy plan comes with Cpanel. You can use the Cpanel to install WordPress with just a few clicks. Question: Who Should Use the $1/monthly Hosting plan from Godaddy? Answer: This plan is good for hosting websites that receive low to moderate traffic. Godaddy allocates 512 MB RAM and 1 CPU to your website when you buy the economy hosting plan. This much resource is OK for small to medium size websites. You also get a free domain name with this plan.